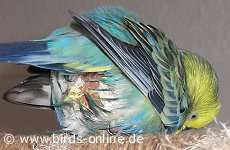 There are many things a bird owner should know concerning the bird's health. And also many facts about diseases should be known to recognize any symptom as soon as possible. In addiction to this, some aspects of well-being are also good to know because the prevention of diseases by healthy nutrition, removing poisonous plants out of a budgie's reach or grazing from the keeper's plate without becoming sick are very important for each and every bird owner. In this subcategory of Birds Online you can find many information that might help you to get more familiar with your bird's health and preventing diseases. On my German website, you can find some more general health topics which are not translated into English so far. My plan is to continue my work and translate more chapters in the future. If you like to assist me in this effort, please feel free to contact me via email.